Wales should hold a referendum on independence if a series of demands are not met after Brexit, Plaid Cymru leader Adam Price has said. In a speech to his party's spring conference, he said European funding for Wales must be guaranteed. Mr Price also called for cuts in VAT for tourism and construction, and for the devolution of powers over air passenger duty. Wales should also control its own migration policy, the leader added. "If you deny us these reasonable demands then we only have one left," Mr Price said. "And that's the right to ask our people whether we would be better to take control of our future as an independent member of a European Union, not a second-class region in a failing British state." The Plaid leader called for "every penny" of the £2.5bn structural funds Wales would have expected in the next EU funding period to be replaced, plus matching funds to provide a £5bn fund for "a fighting chance for us to rebuild our own fortunes". He said Plaid wanted Wales to join the EU as an independent member state with three times as many MEPs as it currently had and a place at the top table. This was a "dangerous" time for Wales, said Mr Price, whose party wants another Brexit referendum. Comparing Jeremy Corbyn and Theresa May, he said: "There is little to distinguish between them in this toxic tango of pathetic procrastination." And in an attack on Mark Drakeford, he accused Wales' first minister of rowing back on a commitment to support a second referendum on leaving the EU. "Mark Drakeford doesn't do demands. He does concessions instead," Mr Price said. The conference in Bangor heard a series of policy proposals from the leader. A Plaid government after the next assembly elections in 2021 would pass laws guaranteeing patients' rights to be treated on time by the NHS. On the economy, Plaid would set up two agencies outside the government to attract investment and help businesses. And teachers would see less interference from the government, making sure they are "better qualified and better paid". While he wanted to breakthrough outside its traditional heartlands, Mr Price said Plaid would never take its core support for granted as Labour had done. Wales faced big changes in the form of climate change, automation and an ageing population, he claimed. A Plaid government would meet those by including a minister for the future in the cabinet, he said. "But friends, if we want to change Wales we have to change too," Mr Price added. "If Wales is going to change, Plaid Cymru has to become a party that wins. "We have to be more open and look outwards, be closer to the people and attract more voters." The party was setting up a new campaigns unit, had created a think tank, and promised more co-ordination between politicians in Cardiff Bay and Westminster. Mr Price also paid tribute to Steffan Lewis, the Plaid AM who died in January, saying his legacy was "an inspiration to us every step we take until we claim our freedom in his name". 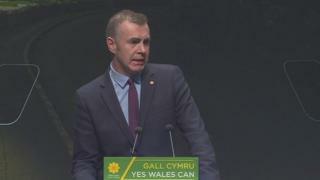 Image caption Jonathan Edwards said Plaid Cymru "was not in the business of wanting to be a junior party to the Labour Party"
Earlier, Adam Price ruled out entering a coalition with either Labour or the Conservatives to form a future Welsh Government. He said voters faced a choice between him or the incumbent - Labour's Mark Drakeford - as first minister at the next assembly election in 2021. Plaid and Labour have worked together in the past in the assembly, forming a coalition government from 2007 to 2011. In a BBC Wales interview, Plaid Cymru MP Jonathan Edwards said his party "was not in the business of wanting to be a junior party to the Labour Party any more in Wales". Speaking to BBC Radio Wales later, Mr Price insisted the MP was not advocating a Tory-Plaid coalition, but was saying that "Labour are as bad as the Conservatives in terms of their negative impact on people's lives in Wales". In his interview, Mr Edwards had welcomed proposals to rename and rebrand Plaid Cymru. The idea had been put forward by Mr Price in his leadership campaign last year and supported by a report he commissioned from former SNP MP Angus Robertson which was published this month. However, Mr Price said on Friday: "We are not going to change the name of Plaid Cymru, but what we have to do is actually change the conversation we're having with the Welsh people."